is flocked by millions of day trippers from all across the globe to get a glimpse of one of the wonders of the world, The Taj Mahal. Taj Mahal is located on the bank of river Yamuna in Uttar Pradesh, India and 200 km south of national capital Delhi. made of white marble in 16th century by the famous Mughal emperor Shah Jahan, who also built the Red Fort in Delhi. He built the Taj in the memory of his wife Mumtaj Mahal. It is basically a mausoleum where the tomb of Mumtaj is placed. One can also see the emperor�s tomb alongside his wife�s tomb inside the Taj. 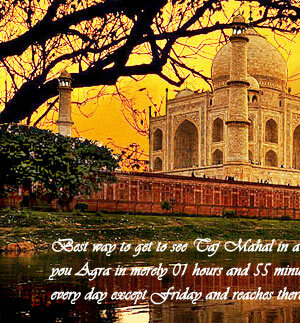 Taj Mahal is closed on every Friday, for its maintenance and Namaz is also offered by the Muslims on this day. So day trip to Agra is not recommended on this particular day. after the death of his favorite wife Mumtaj Mahal. She was died at the age of just 39 years at the time of delivering her fourteenth child. For making this wonder, he called upon artisans from different parts of the world. Persians, Italians, Portuguese and some of the skilled artisans from India. Ustad Ahmad Lahauri was the principal architect of Taj Mahal. He was the Persian architect. It took 22 years to complete the construction of Taj Mahal by 20,000 workers. The fine white marble used to make Taj is the main attraction, which imported from the place called Makarana near Jodhpur in Rajasthan. Taj Mahal is a treat for an architects and historians as this a masterpiece of Mughal architecture. The finest skilled artisans had been employed to make Taj under the guidance of chief architect Ustad. at a distance of 200 km by road. Train takes lesser time than road to reach Agra from Delhi. 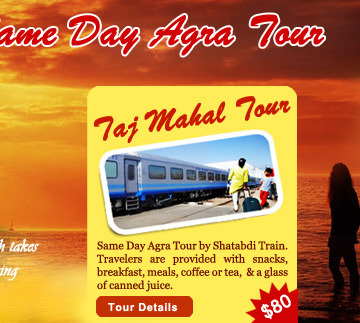 Train is also the preferred way to enjoy same day Agra tour from Delhi because it is fast and comfortable and served breakfast and dinner on board. 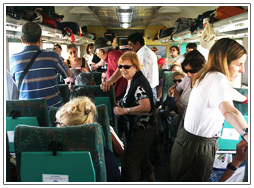 , which leaves at 6 AM from New Delhi railway station and reaches Agra in less than two hours. During the sightseeing tour of Agra, one can also extend oneself toward visiting Agra Fort and Fatehpur Sikri. All three monuments of Agra are listed as UNESCO world heritage sites. Agra fort and fatehpur sikri are also worth seeing and treat for architects and for their generations to come. is also a good option as road condition is so good between two cities. The most amazing thing to watch out for at Taj is an exceptional craftsmanship applied and inlaying edifice with precious and semi precious stone on the best of marble by the skilled artisans in 16th century. is often called as en epitome of love or symbol of love, referring that the passion and love Shahjahan had for his beloved wife was unprecedented. 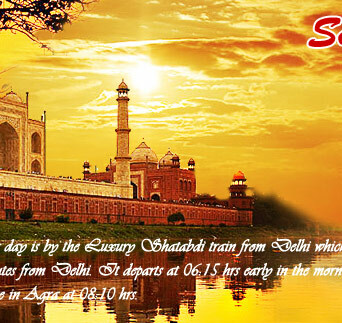 We strongly recommend all the travelers to come to Agra and visit Taj whenever they are in India. It is worth visiting.